Starting Nov 2, Judy Goodson will take over as President of the Louisville DBA. Judy’s day job is running the Main Street branch of Great Western Bank. Stop in and say hi! 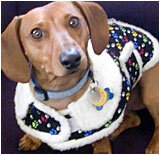 Meet Dexter Angell, a 1.5 year old Dacshund. The very stylish Dexter – takes after his caretaker Shelley – works part time as a Ambassador and Greeter at the Louisville Chamber of Commerce. The DBA has received a 2011 Governor’s Award for Downtown Excellence for the Main Street Patios, from Downtown Colorado Inc. (DCI), a nonprofit organization committed to building better communities through educational and technical assistance. The Patios took the award in the “Colorful Colorado” category. The Governor’s Award recognizes outstanding projects and people that reflect an attitude of perseverance and dedication to community revitalization in Colorado, according to the DCI. Winning projects have been visionary and creative problem-solving solutions accomplished through local grassroots efforts, strong partnerships and innovation. Yup, that’s us all right! We are always so excited about this time of year when we get to chat with all our members and you get to network with your neighbors and fellow business owners and ask us a whole lotta questions. Mostly we just want to say “Thanks” for all you do to keep Downtown Louisville thriving. So don’t miss the fantastic brunch prepared for us by Mountain High and please attend. RSVP to Debksalon@comcast.net. Art galleries, artist and performing studios, art associations and merchants alike are behind a growing movement in downtown Louisville to increase public awareness of Louisville’s vibrant arts district in which both visual and performance art is bountiful. Thus the creation of a new organization, the LADC which seeks to develop and promote Historic Downtown Louisville as a distinctive regional center for the arts to benefit the community as a whole. The LADC is sponsoring Artist Appreciation Month which kicks off November 4 with the regular First Friday Art Walk, 6 – 9 pm. Receptions, live music and other festivities will help showcase dozens of regional artists. On November 5, demonstrations by painters, jewelers and glass blowers will take place during regular hours at the galleries and studios. Participating businesses will offer specials and promotions throughout the celebration. Artists qualify for a special dining out offer during the entire month with many of the art district’s restaurants offering them ‘two-for-one’ dining. Registration is required, and can be obtained at Creations Gallery and Creative Framing Gallery. Additional information at www.louisvilleartsdistrict.com, which also has links to participating members. Creations Gallery has a gift that will outlive the occasion! Browse the affordable, huge selection from 16 of the area’s finest jewelry artists. Pendants, earrings, necklaces, bracelets, and more, ranging from exquisite silver with precious stones to funky and fun. Look for exciting demonstrations too: a glass blower jeweler in the exhibition tent and polymer clay inside the gallery on Saturday. 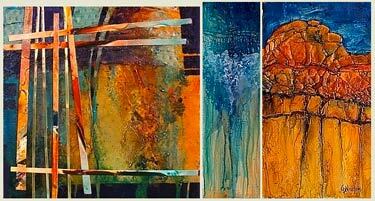 And the truly stunning Acrylic Abstracts & Mixed Media show of Carol Nelson continues through November. Lucky Pie will sponsor a fundraiser for “the Empty Places,” a photo-documentary of historic mental institutions and the history of mental illness in the U.S., created by their friend and co-worker Ralena. There will be a handcrafted menu, a short documentary teaser and most of all, a place where local community, food and art come together to raise awareness for the history of mental illness in America. Tickets are $25 or $30 day of the event. Call 303-666-5743 or visit www.theemptyplaces.com. From November 5 through December 24, the Library will host an exciting new interactive exhibit. This free exhibit, on loan from the Boulder-based Space Science Institute, will make Louisville the first stop on its 10-library national tour. The exhibit highlights the people who carry out earth and environmental science research in challenging places, such as the North and South Poles and in the deep ocean. Along with the hands-on displays, there will be several programs for adults and children. Be part of the exhibit! Bring your memories and photos of local weather events and the library will copy and add them to the display! Celebrate the Holiday season at this charming little store which will offer special deals on Trollbeads and for those starting their first bracelets. Other specials throughout the store will be offered both days. The Holiday Market will feature high-quality, local, artisan items and services with a portion of the proceeds benefitting the Louisville Fire Dept.’s September 11 Memorial Fund. Catch some of your favorite local handmade products like Blossoming, Back to Basics, Glory Bee Honey, Tee and Cakes, Piece, Love & Chocolate, Savory Spice Shop and Woody and Bud. Learn how to make memorable holiday gifts of food with Chef Deb and stop worrying about what to bring to the party! She’ll show you crowd pleasers like Caramel Sauce, Custom S’mores, with homemade Marshmallow and Chocolate Ganache, handcrafted Vanilla Extract and Flavored Cellos. Cost is $20 and advanced registration is required. Contact Barbara at 303-951-0524. And while you’re at it register for Chef Deb’s December class, “Easy, High-End Holiday Appetizers” on Dec. 6th. The yearly Annual Holiday Craft Bazaar will have lots of good items and interesting gift ideas to kick off your holiday shopping. Plus its all for a good cause, so take a few minutes to drop by. You never know what unique things might make perfect gifts for your unique friends or family members. Call 303-664-9039 for more information.